You know, it's all very well lobbying for legislation to remove bagpipes from our streets, but there's nothing quite like taking the law into your own hands. Hello, I'm Major General Linus Barmy-Phipps, and this is very much my department. During my time in the army I learnt how to deal with some of the most dangerous instruments known to modern warfare. It isn't easy to deal with an enraged violinist, or disarm a loaded xylophone, but if you keep your wits about you and you understand exactly what your enemy is capable of, then there's every chance that you will pull through unscathed. I remember once when I was in India I was set upon by some young ruffian wielding a semi-automatic saxophone. He thought he had me cornered, but I kept my nerve and managed to wrest it from the fellow's grip by grabbing hold of the bell with both hands and giving it a sharp tug. Of course, I took instruction from Field Marshall Montgomery himself, who - it is widely rumoured - single-handedly defeated a whole platoon of Nazi trombonists during the North Africa Campaign. 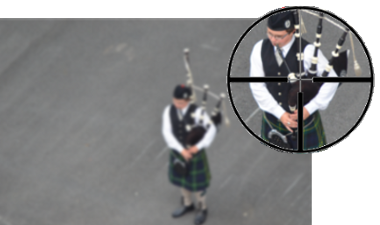 No one would expect an ordinary civilian to tackle dangerous military instruments like that, but there are steps you can take to deal with nuisance bagpipers, should the opportunity arise. That's why we have prepared this handy guide to demonstrate their weak spots and point out the five quickest and most effective ways of disabling the instrument. 2. Block the Pipes. Obstructing the pipes with a potato or similar object prevents the instrument from venting, and allows noxious gasses to build up. 3. Use a barrel organ. The barrel organ is the natural predator of the bagpipe. In the wild, a fully grown adult barrel organ can bring down a set of bagpipes in two minutes flat. 4. Snap the spit pipe. A sharp blow to the spit pipe will paralyse it for life. 5. Turn it over. 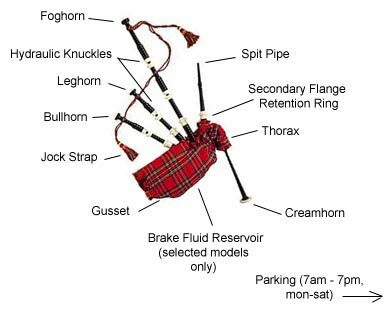 Bagpipes have been carefully designed to cause as much destruction as possible, but they have one major flaw: once they're on their back, they cannot right themselves. So just flip it over and watch the bugger struggle. Remember, a set of bagpipes may seem like a fearsome adversary, but the truth is that it's probably more frightened of you than you are of it. So next time you're out and about and you see one of these scoundrels disturbing the peace with his heathen wailing, just stay calm, remember your duty and slit his sack. It may not make the world a better place, but at least it will make it quieter.